Charles C. Brennan is an entrepreneur and businessman originally from Sioux Falls, South Dakota, and the founder and CEO of the Dollar Loan Center in Las Vegas, Nevada. Q: Something really special happened at the Brennan Rock & Roll Academy here in Sioux Falls recently, right? Charles C. Brennan: Absolutely, something special indeed! 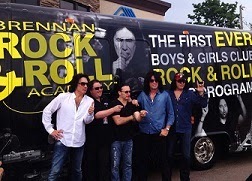 Legendary rock band KISS was in town to dedicate four rehearsal rooms in their names at the Academy. Q: Were they here doing a concert? Charles C. Brennan: Actually, no. They don’t do that many concerts anymore but they made a special trip to be here to support the Boys & Girls Club kids who attend the Academy. Q: They must really believe in what you’re doing. Charles C. Brennan: KISS has been so supportive. They signed autographs, gave high fives to the kids, and really spread a lot of excitement. They believe in our mission to bring free music lessons to kids in our area. Q: And they must be inspiring to a lot of young rockers, no? Q: Is this the first time the band has been to Sioux Falls? Charles C. Brennan: Several members came a few years ago for our grand opening, but this is the first time they’ve all four been here together. We are really privileged to have them come and show their support for what we’re doing.